You may not believe that there’s a fun and easy way to comply with Sarbanes –Oxley, but once you have Sarbanes-Oxley For Dummies, Second Edition in front of you, you’re sure to change your mind. This friendly guide gets you quickly up to speed with the latest SOX legislation and shows you safe and effective ways to reduce compliance costs. 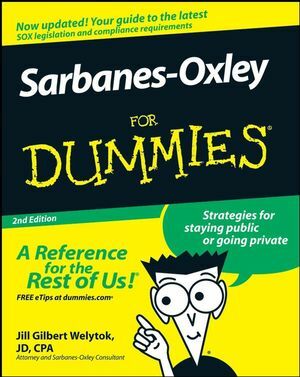 Complete with invaluable tips on how to form an effective audit committee, Sarbanes-Oxley For Dummies is the resource you need to keep your SOX clean. Jill Gilbert Welytok, JD, CPA, LLM, practices in the areas of corporate, nonprofit law, and intellectual property. She is the founder of Absolute Technology Law Group, LLC (www.abtechlaw.com). She went to law school at DePaul University in Chicago, where she was on the Law Review, and she picked up a Masters Degree in Computer Science from Marquette University in Wisconsin, where she now lives. Ms. Welytok also has an LLM in Taxation from DePaul. She was formerly a tax consultant with the predecessor firm to Ernst & Young. She frequently speaks on nonprofit, corporate governance, and taxation issues and will probably come speak to your company or organization if you invite her. You may e-mail her with questions you have about Sarbanes-Oxley or anything else in this book at jwelytok@abtechlaw.com. You can find updates to this book and ongoing information about SOX developments at the author’s Web site, located at www.abtechlaw.com.